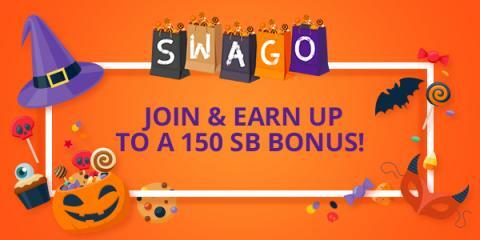 Home CDN , earn money , free money , saving money , swagbucks , swago , US , work-at-home , work-from-home , worldwide Spooky Fun with the October Shop Swago Board! Go to the Swag page and make sure you hit Join , otherwise you won't get credit for completing the action items. Each square on your Swago Board will contain an action item to complete. Once you've achieved a pattern the corresponding Submit button will light up. You can have multiple patterns available for submission, however, you can only submit ONE pattern so choose wisely. The game ends Friday, October 12th at 12pm PDT/3pm EDT. So make sure to hit Submit on the pattern you wish to submit. If you don't hit Submit before the game ends you won't receive your SB bonus. Requested Oct 9/08 - will post back when received.